Are Americans Divided Over the Civil War? According to our mainstream media, which thrives on conflict, Americans are hopelessly divided over the Civil War. Open up a newspaper and you can find scores of articles with titles such as, “After 150 Years, the Civil War Still Divides the United States,” and “150 Years Later, State’s Secession Still Stirs, Still Divides.” Turn on cable news and you will find the various talking heads arguing the same tired script that tugs more at the viewer’s emotions rather than their intellect. Consider a recent episode of the Ed Schultz Show, featuring the always lively, Al Sharpton. Spend enough time in these places and you might even come to believe this alluring cultural meme. Now, I don’t doubt for a moment that Americans disagree over fundamental questions about the history of the Civil War as well as how it ought to be commemorated. There is nothing necessarily wrong with or even interesting about that alone. What I am questioning is the way it divides Americans. It’s the “Still” in this little narrative that troubles me since it implies little to no change in the overall contours of where the nation is in terms of its collective memory. As far as I can tell Americans are not sharply divided over these questions in terms of their regional identification, political affiliation or connection to the Civil War generation itself. In short, we are not living in a “House Divided” and to push such a narrative is facile at best. There is room for disagreement over whether we can fairly judge the morality of the secessionists by the standards of 2010. There is room to debate whether the men who fought for the Confederacy believed they were simply fighting to defend their state, without regard to why their state needed defending, or to what role slavery played in the social order. There might even be room to debate what motivated other states to leave the Union. But those are debates that need to be had honestly, based on what really happened 150 years ago. Pretending that anything other than slavery played a significant role in South Carolina’s secession is not honest, as the secessionists themselves made a point of telling the world with such abundant clarity. I’ve heard it from women and from men, from sober people and from people liquored up on anti-Washington talk. The North wouldn’t let us govern ourselves, they say, and Congress laid on tariffs that hurt the South. So we rebelled. Secession and the Civil War, in other words, were about small government, limited federal powers and states’ rights. But a look through the declaration of causes written by South Carolina and four of the 10 states that followed it out of the Union — which, taken together, paint a kind of self-portrait of the Confederacy — reveals a different story. From Georgia to Texas, each state said the reason it was getting out was that the awful Northern states were threatening to do away with slavery. The Civil War Sesquicentennial is already shaping up to stand in sharp contrast with the divisiveness and narrow scope of the Centennial celebrations – a period that ought to be understood in terms of both a regional and racial divide. Perhaps the most profound change can be found on an institutional level. Consider the recent and upcoming events sponsored by the Lowcountry Civil War Sesquicentennial Commission not to mention the overall focus on and acknowledgment that slavery was central to understanding secession and war by every other state sesquicentennial commission. The documents central to South Carolina’s decision to secede are now in the hands of people who have been educated during one of the most vibrant periods of Civil War/Southern historiography. After displaying the Ordinance documents to a UDC sponsored memorial event, Eric Emerson, executive director of the S.C. Department of Archives and History, expressed his hope “that people will develop ‘a deeper level of understanding’ of secession and war that goes beyond the nostalgia and gets at the heart of one of the most turbulent and talked about periods in South Carolina history.” None of this fits neatly into the “America Divided” meme. We can continue to get lathered up by focusing on Secession Balls and interviews with the usual suspects, who profit one way or another from promoting this “America Divided” narrative or we can step back and acknowledge the vast shift that has taken place in our society that has the potential to bring us even closer together. “There is room for disagreement over whether we can fairly judge the morality of the secessionists by the standards of 2010.” I like the way that was put – I may run off with that. I like that it highlights that causation does not need to invite modern judgment, which is the major stumbling block I often encounter on this issue. Wonderful to see these responses from South Carolina – I will cop to getting a bit “lathered up” about the secession ball issue, but only because it seemed to be the only voice. Thanks for sharing these, Kevin. I think it’s the “only voice” for the very reasons that I suggested in the post. In the end, the work that you do is going to have much more of a long-term impact than anything the organizers of this ball can muster. I agree 100% with the argument that the media is interested in conflict – that’s their bread and butter. And I agree with you that the media’s portrayal of the issue is shallow. What I think is remarkable is that in the span of less than 50 years, you have folks on both sides of the debate, federal and confederate, who both acknowledge that slavery was wrong and an evil that needed to be eradicated. While some of my fellow southerners may not admit it, the fact that so many spend so much time trying to highlight the other causes of the war confirm, at least to me, that they recognize that arguing in favor of slavery or its continuation in the south is a morally vacant position. I was just working on a post for my own blog about the repeal of Don’t Ask Don’t Tell – in the span of 17 years, the American public went from majorities in favor of the ban to 4/5ths of Americans wanting to repeal it. While it’s taken us far longer on the issue of slavery and the place of black Americans, I’m happy to see the same kind of sea change in opinion that has taken place. It’s heartening. I think the Secession Ball itself is more a defensive response to the very changes that you and I acknowledge. I think what has changed is that the post-war arguments of former Confederates that the root cause of secession was anything other than slavery is no longer widely accepted. 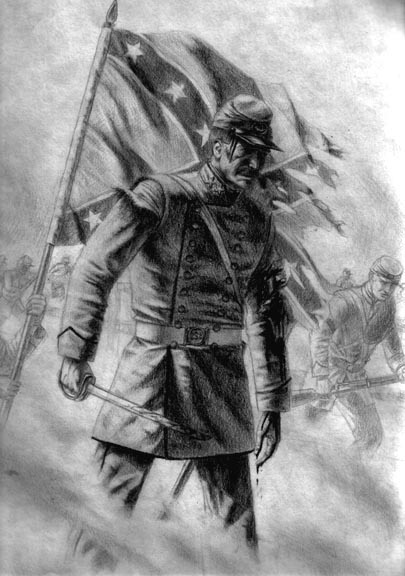 Americans are divided on the Civil War because of a carefully wrought post-war campaign of disinformation led by Jubal Early and others of the Southern Historical Society to cast the conflict in the same romantic terms that led Southern gentlemen in the ante-bellum period to play at being knights and nobles and challenge each other in tournaments derived from “Ivanhoe” and the other novels of Sir Walter Scott. This is where such terms as “The War of Northern Aggression” and “The Lost Cause” originated. Consider the paradigms of nationality and political loyalty before the war. Patriotism was often directed towards individual states rather than the national as a whole. Slavery was an economic interest as much as a moral question. Robert E. Lee and Stonewall Jackson both abhorred slavery but fought for Virginia because it was their native state. (Jackson was a state employee). Ordinary citizens, including free people of color and slaves, in 1861, felt that their country had been invaded by foreign powers in the form of the barely trained 90 day militias sent by Pennsylvania and New York. And those forces acted in ways that seemed calculated to harden resistance. Slavery was already going away. Many slave owners freed their slaves not out of moral conviction that it was wrong but to avoid the expenses associated with their upkeep. Some slaves accompanied their Southern masters in combat situations, not because they supported the “peculiar institution: but because they considered it their duty to the extended family they were part of. John S. Mosby’s servant Arron is a case in point. Mosby wrote that Arron considered himself to be in Confederate Army and took part on small unit actions with him. I cite these instances not to defend the South’s position but to illustrate that the matter was no where as simple as most people assume it was. The lines were not just blurred, but changed constantly as the situation evolved. Also generally ignored in these considerations are the roles of Britain and France and their efforts to encourage the break-up of the United States. This dated to fifty years before the conflict and was a constant theme. The meddling in Texas and Mexico being but one case in point. The fight over slavery was delayed throughout this period not just by political compromise but by efforts to expand slavery by extending it into Mexico and Cuba; efforts which were undermined by the same Christian principles that some of it’s foremost advocates claimed fealty to. Slavery was a doomed institution both on moral and economic grounds, but many people in the Deep South had blinders on, and very romantic notions about how the war would be fought. They saw themselves as heroic defenders of their homeland. And some of their descendants still hold this view and cannot be persuaded otherwise. Well, their ancestors were heroic, but they were also wrong. Actually, historians have shown the exact opposite about the future viability of slavery during the late antebellum period. Slave prices were on the rise and they were being utilized in a wide range of ways that coincided with many white Southerners calling for a more industrial/progressive economy. This notion of slavery as a doomed institution simply does not fit within the latest scholarship. As I recall from my survey text book, cotton may have been dying out as a viable crop in the lowers outh but expansion into parts of Texas, Arizona and California shortly after the war showed there was a viability to the expansion of the crop into the far west….hence providing a continued need for slave labor. It was also a component of their understanding of Manifest Destiny and American Exceptionalism. Keep in mind that the Supreme Court’s ruling in Dred Scott reinforced the belief among slaveholders that they had a constitutional right to bring their slaves west. And though Taney did not say explicitly, the ruling left open the possibility that slavery could move into the states that had already abolished it. “Stonewall Jackson . . . abhorred slavery” Really? Then why did he own slaves both before and after Virginia seceded from the Union? I never found any evidence (and I looked hard) that Jackson personally owned slaves. I did find evidence that he routinely broke the law by teaching black children to read the Bible. There is a book about that. So, please Mr. Snell give me your sources. You need to read, James I. Robertson’s biography of Jackson. >>How did Jackson feel about slavery? Jackson did not leave behind any writings indicating how he felt about the institution of slavery, so we don’t know for certain how he felt about it. We do know that he participated in the slave economy. Jackson owned six individuals while he lived in the Washington Street House. Albert had requested that Jackson purchase him and was hired out a local hotel, Rockbridge Alum Springs, and the Virginia Military Institute as a waiter. Amy, who served as a cook, had requested that Jackson purchase her at a public auction. After his marriage to Mary Anna, the couple received Hetty, Mary Anna’s former nursemaid, and Hetty’s two teenage sons Cyrus and George, from Mary Anna’s father as a wedding gift. Jackson purchased the sixth slave, a small child named Emma, as a gift for his wife. Mary Anna may have also brought two or three more slaves to the marriage who were sold and never lived in the Washington Street house.<< http://www.stonewalljackson.org/faq.html. Considering that this is a site (physically & in the web sense): This is about as favorable a site (short of idolatry) as you're going to get considering that, as the site's mission statement says: "The Stonewall Jackson Foundation’s goal is to preserve Jackson’s former home and its collections, and to educate the public by interpreting the life, character, and times of Thomas J. “Stonewall” Jackson. Special emphasis is placed upon his life as a professor, church leader, businessman, husband, and community leader during the decade that he lived in Lexington and taught at the Virginia Military Institute before the American Civil War." Thanks for the reference, Margaret. This is common knowledge about Jackson, which makes the reader’s request a bit odd. You’re welcome. I figured that coming from such an overwhelmingly pro-Jackson site would give it some additional impact. Personally, don’t find Jackson teaching slaves to read incompatible with his supporting the institution of slavery. Jackson was an extremely devout Presbyterian. Even whites who believed slaves were property still generally recognized their humanity as well. IMHO, for a devout Presbyterian like Jackson, denying any human being regardless of their station in life direct personal access to the word of God as set forth in the Bible would have been unthinkable. The laws regarding teaching slaves to read, OTOH, were the laws of man, not of God. The Custises of Arlington also taught their slaves to read, in defiance of local law, and sponsored elaborate church services for them. They were extremely paternalistic toward their slaves, and were “good” slaveowners as they saw it, but it’s ridiculous to imagine that they, in any shape or form, were opposed to the institution or “abhorred” it. Robert E. Lee’s attitude toward slavery was even more complex, and he proved to be far less kind or indulgent to the slaves under his control than his in-laws had been. A quick search of Ancestry.com 1860 census and slave census turned up Thomas J. Jackson, of Lexington, as the owner of 4 slaves: M, 40, F, 40, M, 17 and F, 15. He owned $3,800 in real estate and $5,200 in personal estate. RE Lee of Arlington, Alexandria, Virginia owned 40 slaves. Lee reported only the value of his real estate, not personal estate, as $80,000. In his study of the Army of Northern Virginia, Joseph Glatthaar determined that anyone with personal wealth of more than $4,000 was “upper class.” All three of these examples are well into the Upper Class. Please separate the male and female members of the Custis and Lee families at Arlington House when you say they did not oppose slavery. There is a fair amount of scholarship that demonstrates how very sincerely the Custis/Lee women and their female relatives, especially Molly Custis, opposed slavery and thought it ruinous for whites as well as blacks. They may have been “maternalistic” in their attitudes, but they wrote eloquently about their abhorrence of slavery, tried to raise money to free slaves,succeeded occasionally, and sent one family to Liberia. On the other hand, R.E. Lee , as evidenced by letters to his wife, speculated that only God knew how much longer slavery would exist and, in the meantime, slavery was improving the Africans. And George Washington Parke Custis, although an early member of the American Colonization Society, was suspected of being the father of a number of slaves. He was not antislavery in his politics, but freed his slaves in his will. HOwever, he was so in debt that their legal emancipation did not take place until the middle of the Civil War, by which time numbers of them were gone anyhow from Union-occupied Arlington House and from the other Custis/Lee plantations. I see it as Lee’s rigorous but narrow sense of duty that he registered their emancipations when he didn’t know where they were and his home had been lost to him for years. Now a question: I never looked at Lee on the 1860 census. Are those his slaves or the ones of GWP Custis who have not yet been freed? A serious question. Nice to hear from you and thanks for this comment. I believe they are the slaves of GWP Custis, but I will allow Andy to respond. I’m not very familiar with Molly Custis, but you’re right to point out that different individuals in the same household often hold divergent views. Each needs to be viewed on his or her own terms. Lee’s entry in the 1860 census is here, and the corresponding slave schedule is here. There are 40 slaves listed, and plenty of ambiguity about their status. By most accounts, the number of slaves at Arlington should have been much higher — perhaps double that, or more. They are listed under Lee’s name, but I’m not aware that he personally owned anything like that number apart from those at Arlington, from the Custis estate. But on the census schedule, Lee lists a value of $80,000 in real property, and nothing in personal property. The census record is a little ambiguous. One thing that might be happening here — and this is speculation on my part, but I think it’s reasonable — is that Lee had, by 1860, hired out a large number of Arlington slaves to others, which effectively dropped them from appearing on the slave schedule under his name. Thus the forty shown are those belonging to the estate, while the others — forty? sixty? eighty? are scattered elsewhere throughout the slaves schedules, under other peoples’ names. Numerous such arrangements are listed on the same page of the slave schedule linked, including one (line 21, left column) noted, “Mr. [Mrs.?] Lee Alexa. Owner.” Given that Lee was long in the practice of hiring out his own slaves, it’s not unreasonable to think that he may have done something similar in his role of managing the Custis estate, perhaps on a large scale. Andy, this is getting a little tangential to the threads, but a bit more might be useful to others. The NPS staff and some hired researchers at Arlington House have collected much useful data in the last 20 years. I don’t think much of it is online, at least not on their website. While working in their files, I learned that many of those owned by GWP Custis were not at Arlington House, which was not a working farm or plantation. They were at more distant plantation sites owned by the family, such as Romancoke and White House. There was indeed some hiring out, but there was also much moving around of the slave population between Arl. House and the farms. This might explain the census a bit. I stand ready to be corrected, but I have always thought RELee brought few, if any, slaves to his marriage. I thought all or almost all came to Arl. House from Mount Vernon or from Mary Lee, nee Randolph, on her marriage. If the slaves that Lee managed when he was infrequently home were really from his wife’s family, that seems to me to be another example of Lee’s marginal status in the Southern gentry, at least until 1861. Tell me if I am wrong. I have always thought the same. My point — not communicated well — was that the 1860 census records are not entirely clear on the matter. It’s good to know that much more intensive work has been done on this, and I hope that it will be made more widely available soon. Remember that the census is self-reported. Unlike last summer, where we received a form in the mail, in 1860, the census taker showed up at the front door and politely asked you the questions. Robert Lee was not at Arlington in the summer of 1860: he had finally left for Texas in February. Custis, though, was there and we can assume he answered the questions. The legal situation was that when Mary Lee’s father died, he left what is called a life estate to Mary, and on her death, the properties would be split, with Arlington going to Custis. Two other plantations would be turned over to Rooney and Robert Junior. Robert Senior was named as the executor. Specific bequests of $10,000 each were to be given to each of the four daughters. And Custis was to drop “Lee” and become a Custis, a common occurrence in these type of inheritance deals. Oh, and the slaves were to be freed when this was finished. I have no idea what the status of women was in Virginia at mid-century but the Lees evidently took the attitude that what was Mary’s – her life estate in Arlington House – was Robert Senior’s. So, when the census taker showed up, either Mary or more likely, Custis, met with the enumerator, D.M. Frank, and told Frank that Col R.E. Lee was the owner of not only Arlington House, but also the owner of the slaves. Given Robert’s efforts to make the various Custis’ properties profitable, it was not an inaccurate description: as the spouse of a Life Tenant, Robert *was* the de facto “owner” of the slaves, an ownership that would have continued until Mary’s death (had the War not intervened). Keep in mind: both Mary and Robert Senior, as well as the seven children were all dependent on the success of Robert as a slave owner, paying off the debts on the properties, making the $40,000 to pay the girls, and then turning the now profitable properties over to the sons. Quoting a daughter as anti-slavery contrasts with her willingness to accept her grandfather’s inheritance, money earned by the slaves. It is easy to be critical about your surroundings but if it was more than words, then she should have rejected the money – then the slaves might have been freed earlier. BTW, Mary was no abolitionist! She was very caustic about anti-slavery abolitionists interfering with the “servants,” “tampering” with them was her word. See Emory Thomas, _Robert E. Lee_, pp 167ff and Joseph Robert, “Lee the Farmer,” JSH 3:4 Nov., 1937), 422-440. I’m glad to learn more about the specifics of GWP Custis’s will, which I have not read for myself. Just read Lee’s letters as he atttempted to carry out the provisions of the will. Thank you for that. Very interesting. In turn, you might find it useful to add context to your views of the Custis/Lee families at Arlington House by checking some of the extensive literature on 19th century Virginia women published in the last 25 years or so. Two classic texts are Suzanne Lebsock _Free Women of Petersburg_ (1984) and Elizabeth Varon _We Mean to be Counted_ (1998). But this may have strayed from the themes far enough. Francis, read ANY scholarly biography of Jackson, and you’ll find that he owned slaves. During his time in Lexington he owned seven slaves, including one who purchased his own freeedom, as Margaret Blough already has pointed out.. Go to Amazon and type “Stonewall Jackson.” Then, take your pick. Look harder next time. I stand corrected, but admit that I had not drilled down into the sources cited. Jackson is a minor character in my novel “The Shenandoah Spy” as the ultimate commander of Belle Boyd, who spied for him. His property interests were irrelevant to the storyline and when you write this kind of fact-based fiction you learn quickly to prune off anything that does not advance the story because otherwise you get lost in the weeds. The fascinating thing about Belle is that she used slaves (and not just her own) in the early part of the war as sub-agents. Her personal servant Eliza Corsey foremost among them. So it seems, at that point, there was understandable caution in the African American community about how things were going. Some of them probably were also involved in the Underground Railroad operations. As for Belle and Eliza, it seems that they were, regardless of respective status, friends. Long after the war, when Belle was a famous actress, she would visit Corsey and her family and bring gifts for her children. I note that two of Jackson’s slaves asked him to purchase them. Apparently he was a better choice. I also note that many slaves managed to buy their own freedom. Elizabeth Keckley, who provided fine gowns for both Mary Todd Lincoln and Varnia Davis did this. I had not thought of Ancestry.com as a research source, so thanks for that. The comment about not judging 1860 events by our current standards is very much on point. The economic values cited for 1856 would have been lowered greatly by the Panic of 1857. In 1860 three dollars was a week’s pay for most people. I am curious as to the historical evidence that one would utilize in characterizing this particular master-slave relationship as one of friends. Did Eliza ever suggest such a relationship? Just curious. “The economic values cited for 1856 would have been lowered greatly by the Panic of 1857. In 1860 three dollars was a week’s pay for most people.” A bit off the topic here, but a sidebar: the $10 and $15 fees to the FSL commissioners were the average sort of pay for doing legal work. Much of A Lincoln’s income came from those sorts of fees. And the mid-teens private’s pay, which included room (of a sort) and board was pretty decent income for an unskilled worker. Belle and Eliza as friends. Well. Eliza helped Belle spy. The servants had an informal network that could be used against the Yankees and Belle fueled it with money. There was some risk. The post-war friendship was cited in Louis Sigaud’s biography of Belle, published in the 1930s. This was the first unbiased book about her. Eliza could have been arrested by the Union when Belle was had anyone known about her participation, but those particular Union officers were pretty clueless about the social dynamics and the larger meaning of “family”, which is where most loyalties lodged first. Eliza was illiterate and left no written records. The position of those slaves who were used as servants was much better than most. Some of them, sadly, were blood relations. Often they were petted and indulged. The position of a white woman, legally and practically, was often not that much different from her black sisters. There was another civil war war in progress, between men and women, that continues to this day. Given the absolute power that masters had over their slaves, the caution and deceptions of African-Americans was quite understandable. They were survivors. Most were just trying to get by and the Union forces had as many racists and bigots as the Confederate, so until the Emancipation Proclamation, they were really unsure of what the outcome would be. Proposals about compromises to preserve slavery and preserve the Union that way were made fairly often both to prevent the war and to bring it to a quick end. In times that uncertain I think the natural tendency is to rely upon “family” first and foremost, regardless of skin color. Mary Chesnut trusted her servants to hide her jewels and silver from the Union looters. They did. This and the rest of your comment hardly counts as evidence that they were friends. Many of the women’s rights advocates pushed this line of argument, but I fail to see what it has to do with whether these two individuals were friends. Am I to assume that you have no evidence? Well, I previously cited Sigaud on this. I would cite Belle’s own book had I not already determined it was a propaganda piece actually ghost written by George Augusta Sala as part of Henry Hotze’s rather effective disinformation campaign. (Textual analysis and comparison with his 1864 book about his trip to American in the midst of war.) In there Belle espouses the usual defensive claptrap about the slaves being less capable, like children. And per Sigaud, I think that if a white woman visits a former slave of hers decades after the war and brings presents, it does not say that there was hostility between them. If that were true, why bother to visit at all and why would that former slave accept them or her? Sigaud interviewed Belle’s own children for that book and her third husband Nat High, who was quite a bit younger than she. Perhaps the tale is like Hemingway said (“It would be pretty to think so” )but why discount it entirely when other reading of the period seem to also portray that same kind of “family” feeling between white and black women who grew up together. As a practical manner, regardless of their true feelings, black folks were constrained to put a good face on the surface of these relationships. That’s just the logic of the situation. They had no defense except manners. I don’t know what such a visit means. That’s the job of the historian to piece together based on the available evidence. Unfortunately, sometimes we have to refrain from concluding based on the available evidence. I don’t see anything here that suggests that the two were friends. I sense a “tut-tut” coming here because some of the fine details are made up and filled in, but no less a historian than Jill Lepore of Harvard University wrote in one of her New Yorker columns a couple of years ago that historical fiction of this kind might get closer to the truth than a simple recitation of facts. And at least give me credit for trying to get at the truth rather than just making it up with characters that are entirely fictitious. As for Civil War source material I’ve come to the conclusion that most of it is a kind of fiction anyway. I felt myself at liberty to create a tale that would please an audience and perhaps spark further investigation on the part of the readers of it. At the very least I seek to reframe the usual arguments about the culture of the times and the events of the war which are passed over because everyone “knows” what happened. I’m sorry as I thought you were making a claim about history and not historical fiction. I think the comments about expanding slave cultivation are to the point. My impression (mainly from Macpherson Battle Cry of Freedom) is (1) Lincoln’s understanding of the slave economy was that it had to continuously expand in area to remain profitable. His policy of restricting it to the existing slave states was therefore a plan to destroy it. The political advantage was that Northerners for whom abolition was not a priority would vote and fight for the right to settle the new territories as “free soil”. (2) The slaveowners also understood this, and fought for the right to expand slavery. This of course made any peaceful separation impossible, as Confederate independence would have been followed by a war over who was to have the unsettled part of the country. Is that how you see it, Kevin? On another point, how can anyone believe the South fought for states’ rights? Was there ever a greater violation of SR than the Fugitive Slave Act? I gather the idea that the southern cause included SR was invented by the governors of North Carolina and Georgia to justify defying the Confederate government. Lincoln was convinced that the “founding fathers” intended slavery to gradually die, which is why he was so upset with Douglas’s Kansas-Nebraska legislation. The free labor ideology originally took hold in the 1830s in response to concerns surrounding wage labor in the North, but eventually was employed against the slaveholding South. I agree that most Americans advocated for free labor not out of concern for free and enslaved blacks, but in the hope that white Americans would have increased opportunity out West. No one advocated harder for it than Lincoln. Keep in mind that after the Dred Scott decision white Southerners could more easily push for what they saw as a constitutional right to own slaves and take them where they will. The Southern states embraced a states rights position only after they were convinced that slavery was no longer safe within a strong federal government. Throughout the 1850s white Southerners urged the federal government to flex its muscle in enforcing the Fugitive Slave Act and it was Northern states that resisted. Thanks for the comment and I hope I’ve answered your question. Part of the research for my next Civil War novel has taken me to the efforts by the “filibusters” to take over Cuba and bring it into the Union as a slave state. There had also been a proposal to simply take over Mexico after that war and do likewise, but that was shot down, by of all people, John Calhoun, who thought that it would be too difficult to absorb it. His reasons included the “mixed blood” of the population and the brand of Catholicism. My reading indicates that the further south one went the stronger the pro-slavery sentiment. John Randolph of Virginia said about the Underground railroad “If the Slave doers not run away from his master, the master will have to run away from his slave”. He was speaking to the costs of maintaining slaves, who were expected to receive adequate food, shelter, and clothing and to be cared for when they were sick. It was, in a way, the ultimate social welfare system.and I suspect that kept many from simply leaving and going North. Slaves were always on the look out for a “good situation” and that may have been the root of the request of two of Jackson’s slaves that he buy and own them. As for the position of women, Abolitionism was a Quaker enterprise financed by rich people in Boston and it had a strong leaning toward feminism. During the Buchanan administration the most powerful political figure in Washington was Rose Greenhow. She couldn’t vote, but she could dispense political patronage and affect legislation and she played both sides of the question, taking Henry Wilson the Chair of the Senate Military Committee as a lover. She also served as a useful “beard” for Buchanan, who was gay. This was the same era that produced Amanda Bloomer and those experimental communes up north. These influences have largely been overlooked by historians because there is a singular lack of proof. Many letters were burned after these people died by outraged or embarrassed relatives. Greenhow is the protagonist of my next novel. The Confederate government actually was more liberal on feminist issues than the Union. Belle Boyd became the first woman in American history to be formally commissioned an army officer in 1862. Rose Greenhow, after the Union released her and sent her South became a Confederate diplomat and agent of influence in Europe. Other female spies were also given officer’s ranks. Belle may have been promoted as high as Lt. Colonel. The adherence to a States Rights doctrine doomed the Confederacy from the start. It made a unified command authority impossible. Some people just would not accept the inevitable. There is an account of a slave trader trying to load 40 or so slaves onto the train that took the officials of the Confederate government out of Richmond. I’m not sure what this means.